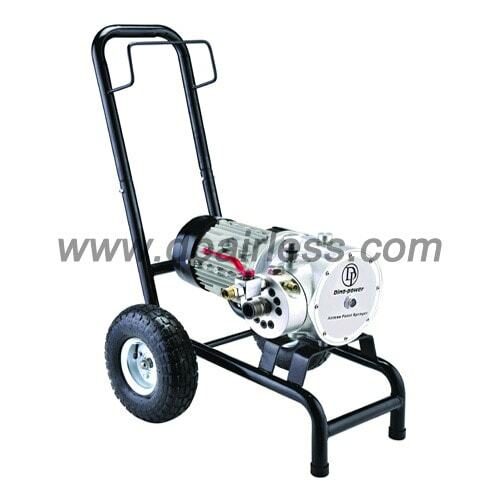 DP-6870 high pressure electric airless paint sprayer with diaphragm pump is specifically designed for the professional painter, equipped with 2.2KW 3HP Induction motor (brushless). It’s the ideal sprayer for people who want to spray residential and commercial building in big area, interior as well as exterior. Big capacity and high efficiency. Spare parts for repairing 1. Diaphragm. 2. Outlet valve 3. Inlet valve 4. Airless tip / tip gasket / tip guard / filter. Big size inlet / outlet valve, big size diaphragm, and strong power, generate the big output volume per minute. Support maximum 0.035″ tip size, which will short your painting job time, and much higher efficiency. Ideal for big contractors, professional painters…..
Is this motor 3 phase ? we like this diaphragm pump spraying equipment, can we use it for epoxy? roofing painting? what’s the pressure when using the 535 nozzle size? is your suction valve / pressure valve same as Italian manufacturer like Larius, Tecnover, or Asturo? and what about the diaphragm / membrane?